Tudors skipper Jordan Parkes sat down with reporter Allan Mitchell to chat about his most recent spell with the club. “I was buzzing to re-sign for Hemel,” he said. “I had a lot of options to go to different clubs but knew that I only really wanted to come back here. 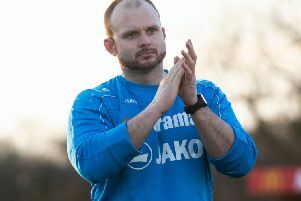 “I knew that Deano [boss Dean Brennan] and Stu [assistant manager Stuart Maynard] would get the best out of me and I’m definitely enjoying my football again. “When I first came back to the club, it was a tough time. We weren’t playing our usual exciting style of football and results were hard to come by. “I never doubted coming back as I know that Deano and Stu are never happy with mediocrity and strive to be the best they can be. “Changes needed to be made and we needed to get back to our exciting, attacking style of play. We now have a more settled side and we have started to form partnerships across the pitch. We are now starting to understand how each player plays and the ways we can make them most effective in games. Asked about the support from fans, sponsors and the chairman that resulted in his return, he said: “I was extremely humbled by the generosity of the supporters and sponsors [Underwoods and O’Rourke] to help bring me back. I hope they feel their investment has been worthwhile! I appreciate every bit of support we get and as a local lad I care about the club. “The fans that travel across the south of the country to support us is fantastic and the players and myself truly appreciate their efforts. Asked about forward Charlie Sheringham, son of Spurs and England legend Teddy, and who signed for Hemel on loan from big-spending Ebbsfleet at the beginning of February, Parkes said: “He has been brilliant for us since he came in, Charlie was one of my mates at Ebbsfleet and as soon as Deano said there was a chance for us to bring him in, I was straight on the phone to him persuading him that he would enjoy it here. “He is definitely enjoying his football and scoring freely. He was exactly the type of player that we needed to bring in, someone that we can use as a target, who is reliable, works hard and wants to succeed within the game. “As with most players at this level everyone just wants to play football and that becomes more important than money. Asked about Town’s playoff chances, Parkes said: “The playoffs maybe a little bit of a stretch now for this season as the gap looks too big. “However our form since December has been excellent and a couple of strange results the last few months have been enjoyable. We will be looking to finish as high up the league as possible and of course it would be lovely to finish above St Albans.